Lamp flasher circuit is an electronic device that control a lamp to flash in periodic manner. Lamp flasher can be designed using semiconductor or other active components. Here we use two relays as the active components, plus some other passive components. Relay can be considered as an active component since it receives small power input to control higher output power. In electronics term, an active components is an electronic component that is able to amplify. You can say that we just need to supply about 50 mA current to produce 5A or more current. It doesn’t mean producing more energy from nothing, but it actually only controls other power source by switching on or switching off. I designed this circuit based on the idea of sawtooth signal generator circuit which is usually built using SCR, but here we replace the SCR with a relay. To learn how this lamp flasher circuit work, let’s first see the schematic diagram of the circuit below. 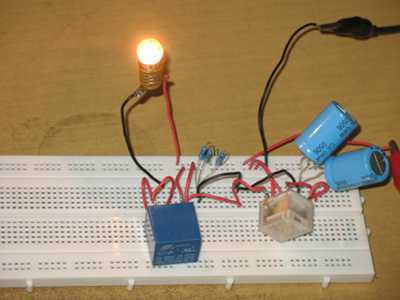 The circuit is built using two relays, two diodes, one capacitor, and one resistor. The rest is the controlled lamp. At non powered condition, before the power supply is connected, both relays are off. When the power supply is connected, the capacitor is charged through the resistor and the voltage is increased gradually. At some point, the RELAY1 is activated first since it doesn’t have diodes in series, so its solenoid/coil receives higher voltage than the RELAY2s. The activation of the firs relay turns the lamp on, and the voltage of capacitor is continually increasing. After some point then the second relay is activated and short the capacitor to ground. Shorting this capacitor cause the voltage drops quickly, both relays are deactivated, the lamp is turned off, and the circuit repeats the charging cycle just like as the first time the power is connected. After R1 has been selected, now you can make experiments with the capacitor to get suitable timing for your need. If you need to flash power line bulbs, you can use the RELAY2 contacts to control high voltage safely since its contacts is isolated from 12V circuit. Watch our video at our channel on Youtube and good luck!